Just in time for the holidays! A special gift to anyone special in your life. 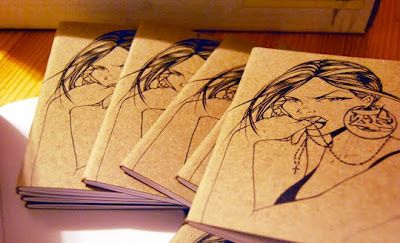 Toofly pocket size sketchbooks. 32 pages of high quality, eco-friendly 100% recycled paper with one of her favorite girl mark illustrations. Printed with black soy ink on chipboard, this 3.5″ W X 5″ H sketchbook has saddle-stitch binding, and rounded corners. Easy to slip in and out of your pocket when you feel the urge to sketch, write, or catch a tag! Limited Edition of 50. Signed and numbered by Toofly. $12 bucks. Thanks again to Toofly for keeping us informed with all her goodies! Sono molto grato a voi per informazioni. [url=http://lacasadicavour.com/trial-packs/ ]generico cialis online [/url]Penso che questo sia una splendida idea http://lacasadicavour.com/eriacta/ vendita cialis online Assolutamente d'accordo con lei. In questo nulla in vi e credo che questa sia un'ottima idea. Sono d'accordo con te.